The three local mobile carriers are diversifying their business portfolios amid saturation of the domestic mobile telecom market. SK Telecom, KT and LG Uplus are likely to strengthen their focus on the Internet of Things (IoT), one of the major new growth engines for the telecom industry. SK Telecom, the nation’s largest mobile carrier, said it is looking to three new businesses ― media, healthcare and business-to-business (B2B) including the IoT ― in the coming years. KT, the nation’s largest fixed-line operator, plans to continue its five key new businesses ― smart energy, integrated security systems, media, healthcare and intelligent traffic control. Chairman Hwang Chang-gyu pledged to foster the five segments. The Ministry of Science, ICT and Future Planning said yesterday the number of altteul, or thrifty, phones in use nearly doubled in a year to 2.48 million as of Dec. 31. 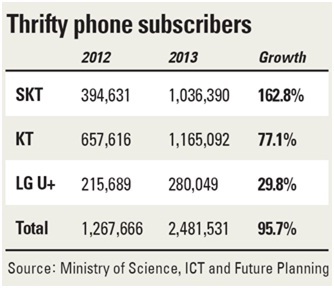 Thrifty phones now account for 4.55 percent of the mobile phone market. The altteul phone service (MVNO) provides affordable mobile communications services by borrowing radio wave spectrums from conventional mobile networks. The growth in altteul subscribers was most pronounced in the fourth quarter, when the thrifty smartphones started selling at post offices and at E-Mart.The 12 altteul phone businesses that provide service by borrowing from KT’s network had 1.165 million subscribers, while the nine operators borrowing from SK Telecom attracted 1.036. Seven businesses that borrowed from LG U+ had 280,000. However, the highest growth rate of 162 percent was seen in SK affiliates, which went from 394,000 subscribers to 11.036 million. This was followed by 77 percent for KT affiliates, from 657,000 to 1.165 million, and 29 percent for LG U+ affiliates, which saw subscribers rise from 215,000 to 280,000. Meanwhile, revenue for altteul phone operators for 2013 shot up 107 percent form 119 billion won ($111.9 million) in 2012 to 247.4 billion won last year. Sales of altteul phone devices were 378.3 billion won in 2013. Lee Suk-chae, chairman and CEO of telecommunications giant KT, vowed Tuesday to develop more content-oriented revenue sources, saying it can’t survive by only sticking to its conventional business models. He said the nation’s dominant fixed-line operator is going to spend 3 trillion won by 2017 on a “network revolution” in a strategy to offer creative contents and services that run on faster networks. In detail, the company plans to invest 2.5 trillion won in backbone networks, while the remaining 500 billion won will be used to speed up networks for households. Local mobile carriers are aggressively expanding their long-term evolution (LTE) networks but this is raising concern among some observers that Korea maybe going a little too fast and could lose money and isolate itself technology-wise. 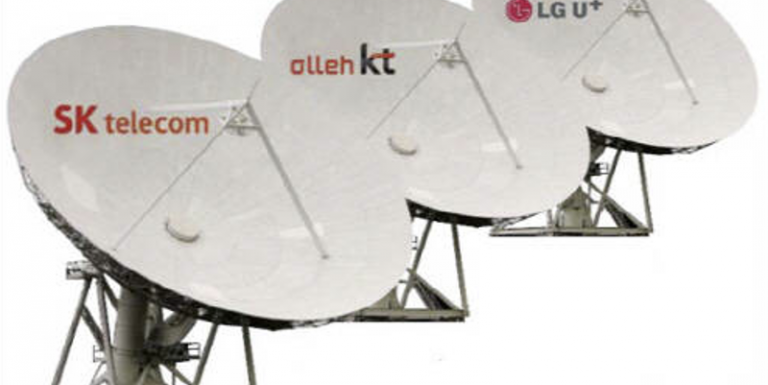 SK Telecom, KT and LG Uplus have poured trillions of won in building additional radio stations and access points for LTE across the country since 2011. No country has a higher penetration of the fourth-generation (4G) network than Korea, though the United States and China obviously have a higher number of subscribers. 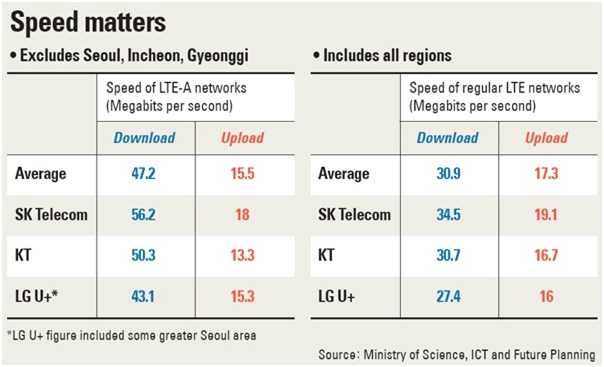 Over 60 percent of smartphone owners in Korea use LTE, which amounts to 16 million people, according to local analysts. Korea is the only country embracing LTE technology at this rate. The U.S. and China still widely use 2G and 3G connections. In Europe, the LTE market is just blossoming, and developing nations are still in the process of transitioning. Mobile operators are frustrated with automobile firms for being slow in adopting converged services in cars. SK Telecom, KT and LG Uplus have vowed since early 2008 to make what they call smart cars that use information technology for both public and private vehicles. The three carriers have already signed agreements with car makers for mutual cooperation. But a truly dynamic service that combines their capabilities is yet to surface due to automobile companies’ sluggishness and domineering attitude, said officials from the carriers. SK Telecom and KT are partnered up with Kia Motor and Hyundai Motors respectively, while LG Uplus has signed pacts with multiple small- and medium-sized firms. So far, KT, Korea’s No. 1 fixed-line and runner-up mobile operator, has been most active in marrying information technology and vehicles. It recently agreed to implement some of its service on Hyundai’s buses and trucks that help clients locate their cars and archive driving history.